With the recent passing of Richard Didier, Klockit lost a truly special customer and many of us, as employees of Klockit, lost a mentor and valued friend. Rich loved building beautiful clocks and furniture items from Klockit plans and kits, as well as creating his own unique designs. Many of Rich’s beautiful clocks and furnishings graced his home and many more of his beautiful pieces were given as treasured gifts to family and friends. 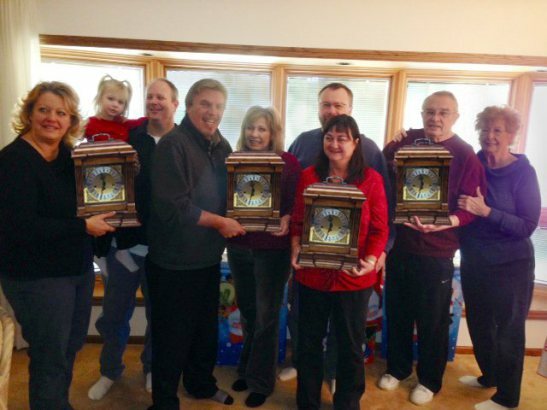 Here’s the perfect example: Rich built four 40th Anniversary mantel clocks for his friends and family for Christmas this past year. His family members are pictured below, holding handcrafted heirlooms that will be treasured for years to come. Although the craftsmanship of his work was always as close to perfect as one could ever want to see, Rich was extremely humble about his work and he strived for perfection on each project he tackled. Countless times, over many years, Rich offered up invaluable advice on ways we could design better kit and plan products. 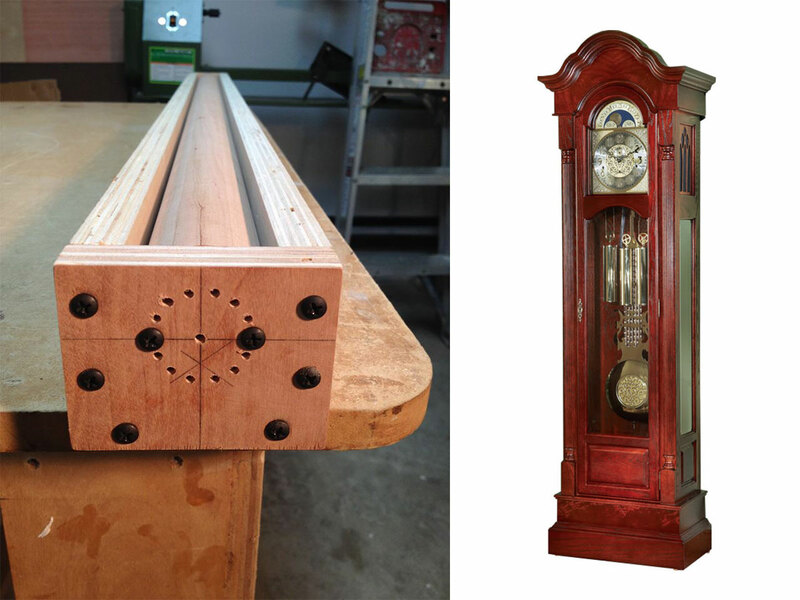 We have enjoyed working with Rich on numerous woodworking projects, dating back to when we first wanted to incorporate information for creating “Hard-To-Make” parts like crown moldings and split columns for the Churchill Grandfather Clock plans. Rich was instrumental in confirming that our ‘Step-By-Step” plan information was accurate by actually making the parts in his shop from our drawings. 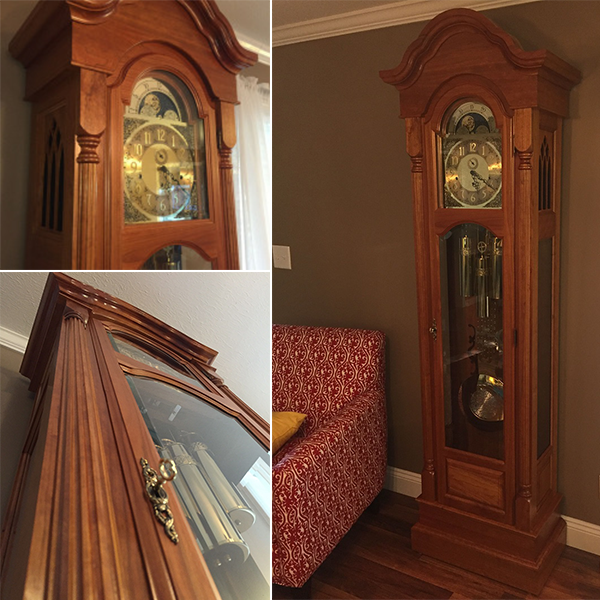 Rich completed more than 25 projects over the years, the most notable include building a Cooper Collection grandfather clock, and designing and building the Mora Grandfather Clock – which he later helped Klockit develop into a woodworking plan product. Rich also built various photography models from Klockit’s exclusive furniture plans that were used in the Klockit catalog and website. I personally have had the honor of working with many Klockit customers, and to learn so much from them that has made me a better kit and plan designer over the past 30 plus years. It is safe to say, however, that no one has done more to help me develop my woodworking knowledge than Richard Didier. More important, however, is that I have had the privilege of having him as a dear friend. Goodbye Rich. You will be missed but you will always be remembered. What are you thankful for this holiday season? This is the time of year when I like to reflect on the important things in life. 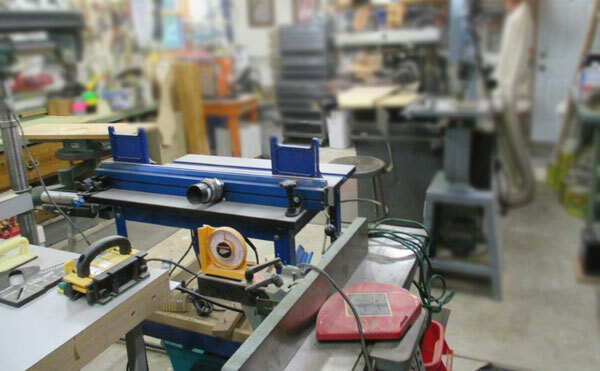 Thankfully, I am fortunate to have a nice home shop with machinery, equipment, and tools that are certainly adequate for the woodworking projects I do for Klockit and for my personal use. Not unlike a lot of my fellow woodworking enthusiasts, every now and then I start to think I need bigger, fancier, or additional equipment than what I already have! When these thoughts enter my mind, I have only to look up on my shop wall at the few basic hand tools my father used in the 40s and 50s to quickly get back to feeling pretty good about the tools I have. My father used those tools to build kitchen cabinets for my mom and other furnishings (bookcases, tables, etc.) for our old farmhouse. Like myself, I would guess that a lot of our Klockit customers gained their love of woodworking from watching and helping their dads and grandfathers. I often wonder what my dad would think of my woodworking skills. Hopefully he would approve! 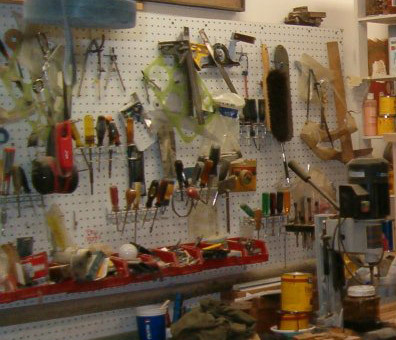 I am very sure he would be amazed at all of the woodworking machinery and tools I have at my disposal, and I suspect he would maybe tease me a bit about needing all the stuff I have! What are you thankful for this holiday season? Leave a comment below!